Mechanix Wear The Original 0.5mm High Dexterity Gloves are perfect for those looking for protection for their hands but need precision handling. 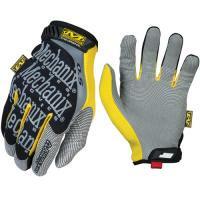 Mechanix Wear constructs these gloves from 0.5mm synthentic palm material, allowing you full dexterity. The Originals will give you a close to the hand fit and feature TrekDry® material, giving you a form-fitted feel while keeping your hands comfortable and cool. For added durability, the glove's panels are reinforced in high areas. Additional features of Mechanix Wear's 0.5mm High Dexterity include the thermal plastic rubber closure that is secured using hook and loop. The gloves are machine washable making them both practical and easy to maintain. Thermal plastic rubber closure that are secured using hook and loop.